For those of you that have been visiting this newly created little blog for the last few weeks as part of the One Room Challenge, (thank you, BTW! 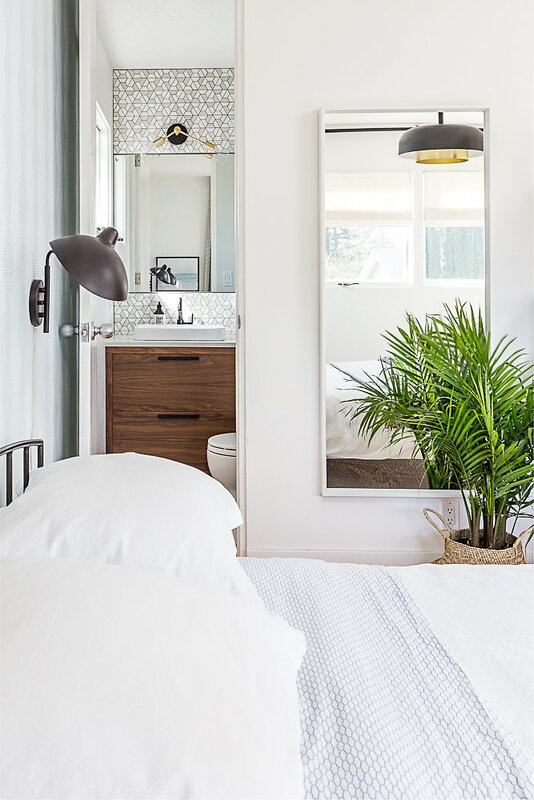 ), you will know that Graham and I just completed the renovation of our tiny two piece ensuite and master bedroom in our 1960's bungalow. If you are new here, welcome! Click over here to see the full reveal of the two spaces. Today I'm chatting about our ensuite and small bathroom design. If this is your first time here, thank you for joining us. Sign up to receive our weekly blog posts delivered straight to your inbox. 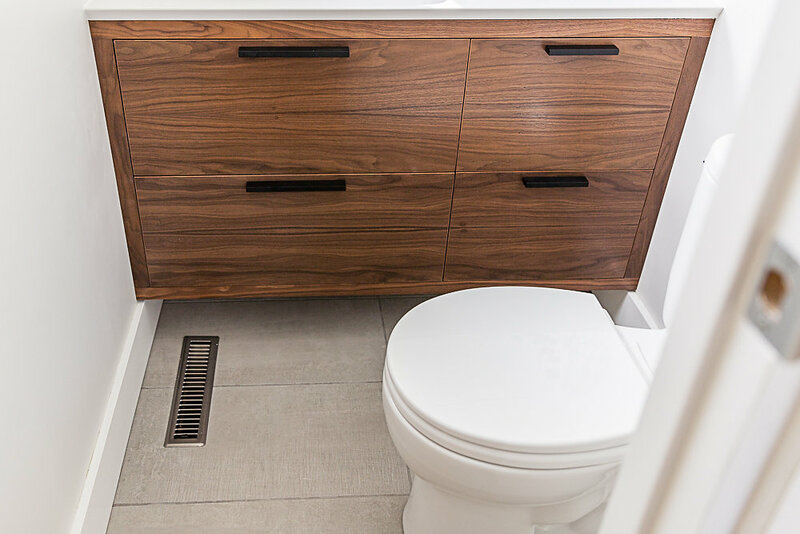 Most mid-century homes in Calgary and beyond were built with utilitarian kitchens and bathrooms, large enough to do the task at hand and not much more. Fast forward 60 years or so to today, and our kitchens have become the hub of the home and bathrooms a place of relaxation and rejuvenation. Let me tell you, there was nothing rejuvenating about our tight little bathroom, and I can't explain how much I was grossed out by my leg brushing past the toilet bowl. Euch! The challenge we faced was how to maximize this 4' x 5' room when adding square footage was not an option. We employed a few space saving and space enhancing design tricks to really make the most of the room. 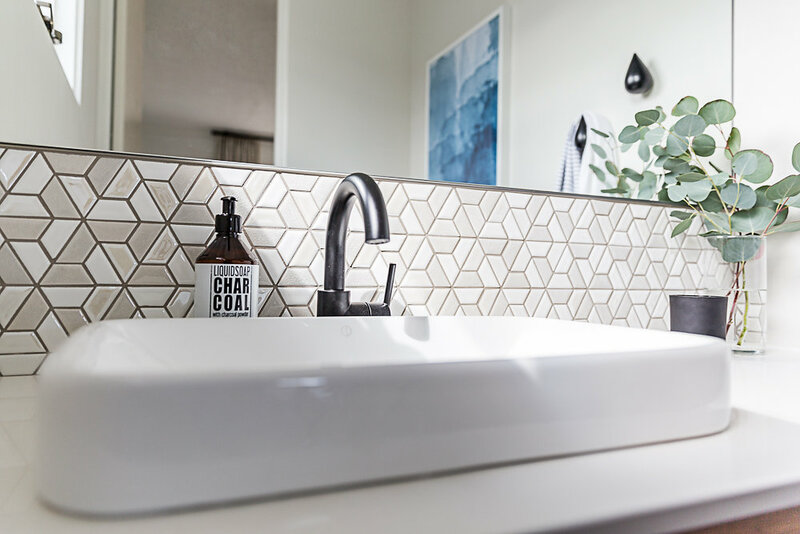 These can easily be applied to any small bathroom, so here goes with my top five tips to help you get the max out of your mini bathroom. Doors can take up a lot of room. Seems silly, but by the time you figure in the door swing and the room the door takes up in a room when open, the space can get tight really quickly. We took the simple approach and reversed the door swing. By changing the door to swing out rather than into the bathroom, we gained a lot of floor space. We also no longer have to do an awkward jig around the door, then the toilet, then the door again to get to the washbasin. And my legs don't have to brush against toilet bowl - WINNER! Just check that you have room in the adjoining space to accommodate the door swing. We could have installed a pocket or sliding door too. A pocket door slides inside the wall, disappearing completely when it's open. Just check for electrical, plumbing or ductwork in the wall - an easy solution can suddenly become costly if you have to re-locate these. As we had electrical in the wall we opted to save our dollars and put them towards higher end finishes instead. A sliding door (or barn door) hangs on hardware on the outside of the opening is another good option if you want to avoid opening up the walls, but I did want to be able to fully close the door, something a sliding door doesn't really do as it hangs in front of the opening. Not that I often have the door closed - any Mums reading will know what I mean, but hey, a girl can try, right? Sometimes the best thing to do to gain space and function is to move the plumbing - in our case the most obvious thing to move was the toilet so that it would be adjacent to the sink. That would open up a lot more floor space. However, I wasn't convinced this was the right move for us - we really loved the long counter and that we had the ability for the two of us to get ready at the same time. (I know. Ridiculous in a 4' x 5' space, but it's true.). And the amount of storage space we would lose would be significant. Plus, knowing that we plan to move from this house in the next year or so I wasn't convinced that the expense would be worth it. Instead I focused on the fixtures: I contemplated a wall hung toilet with the tank in the wall. Honestly this would have been the best solution, but is really only worth doing if you are doing a 'back to the studs' renovation as it is costly. Instead we selected the TOTO Entrada Round Bowl (not elongated!) toilet as it was a full 2" shorter in depth than the existing. It's only 2", but it makes a big difference in such a small space. I have to say, this toilet is so darn cute, (I'm seriously wondering about myself with that statement) and the performance has been great. In another space saving move we plumped for a half mount sink (it mounts partially above and partially below the counter) so that we didn't need to lose too much vanity space to accommodate the bowl of the sink - we would have sacrificed a lot more storage if we had gone with an under mount option. It also doesn't overwhelm the space - a full vessel sink would be a few inches higher than ours and would have felt huge and out of proportion. Consider what you need to use your sink for - in a powder room a very small sink will suffice as it will only be used for washing hands. In our case, we wanted something a little larger to accommodate shaving, face washing etc. It may seem tedious or extreme, but this is honestly such an important part of the planning phase. I conducted an inventory of everything that we were storing in our bathroom prior to the renovation. And anything that we wanted to store but couldn't. This meant I could design our custom vanity to fit our needs exactly. For example, Graham's favourite lotion is in a tall, unattractive bottle and it always lived on the counter as it didn't fit in the cabinet. I could decant it into something pretty, but honestly I don't have time for that on a day to day basis! Do you? I'm going to guess no, so make sure your storage will fit what you need to put in it! His lotion bottle now fits perfectly inoffensively in one of the drawers. Mission accomplished! 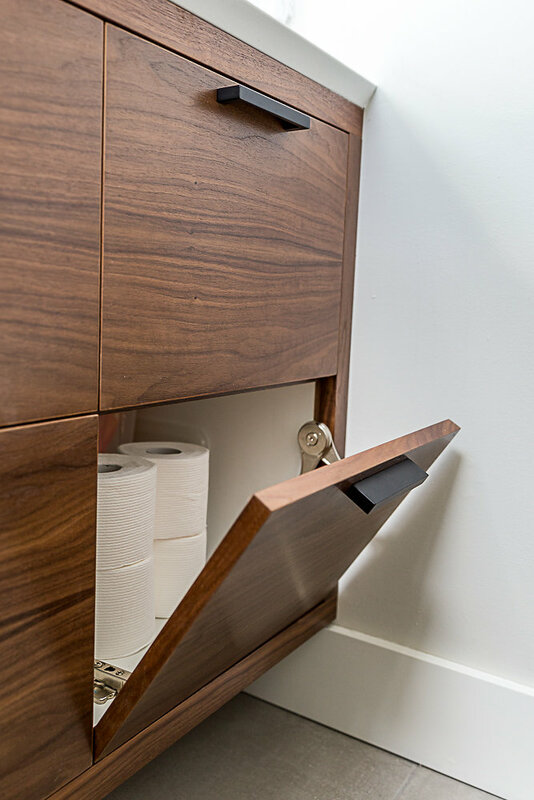 I also wanted to be able to store toilet paper in a convenient place - previously it was stored in a closet outside the bedroom, so not an ideal situation if you were caught short! LOL! We planned these flip down doors to open without banging into the adjacent toilet, with plenty of depth to store lots of rolls! Aren't they great? Allow me to get a bit space planning nerdy for a second - the reason I didn't put drawers here is that I gain more storage with a full cabinet. Drawers take up a fair bit of space by the time you factor in the runners and the drawer box, plus you can't utilize the absolute full depth of the cabinet. Seeing as the items stored in this section of the bathroom are lower use, it seemed the best solution for our needs. It is so worth taking the time to plan this properly - I can't tell you how much pleasure I derive from having everything in it's place! 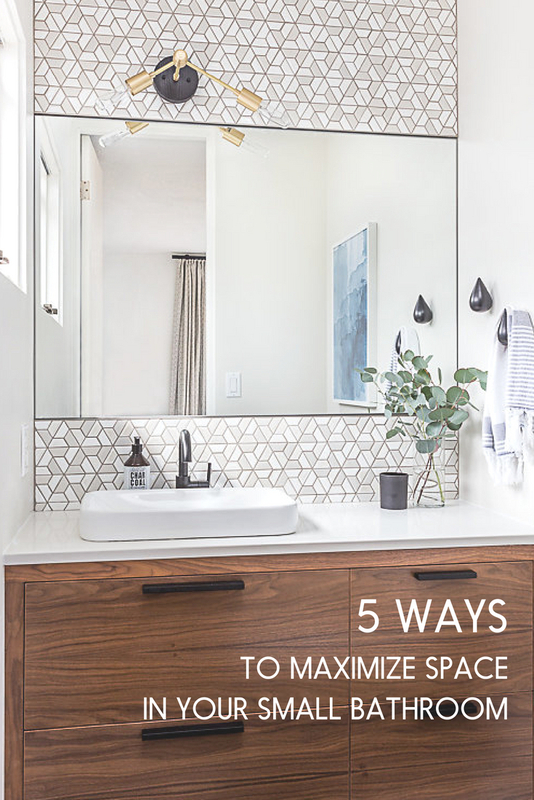 Not exactly a news flash, but a floating vanity can help to visually expand a bathroom for the simple reason that you can see more of the floor. To be fair, as mine is only 6" off the floor you don't see a whole lot more, but I do gain an easy place to store our scales. :) If you have 8 - 9" between the floor and the vanity you will definitely notice a difference. If you prefer a standard floor standing vanity, or if you are re-working an existing one, you can attach mirror to the toe-kick which has a similar effect of expanding the floor space as it simply reflects it. Placing a mirror anywhere always has a dynamic effect bouncing light around and creating a visually larger space. 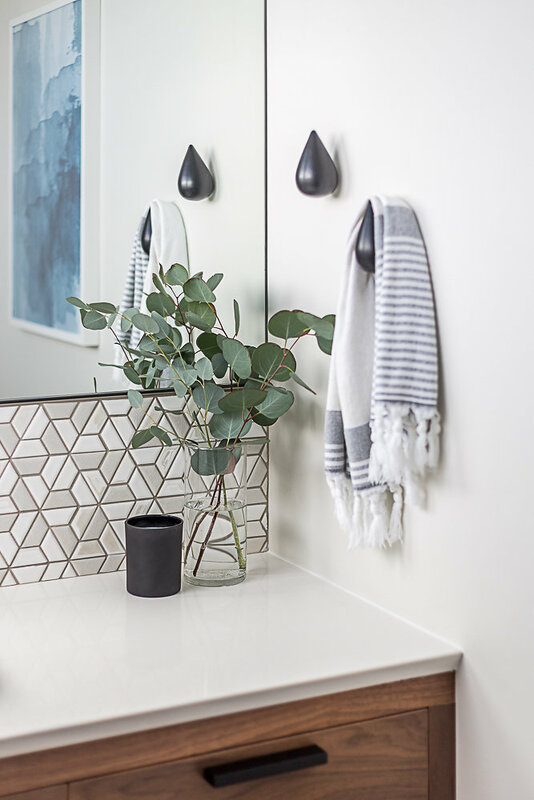 We wanted to keep our mirror simple so that it wasn't the focal point - no frame, no bevelled edges and going the full vanity width achieved the look we were after. I can't believe how much the room opens up for going full width - plus it means we can both get ready simultaneously. A huge bonus and time saver for us! For more inspiration follow my Modern + Mid Century bathroom Pinterest board - I'm always finding more cool ideas! If you are feeling stumped with your own small bathroom, and would like to work with us to find some creative solutions that work with your modern style please do get in touch. We love a good challenge and we'd love to hear about yours! Newer PostMid Century Modern Design - Why does it have enduring appeal? Older PostOne Room Challenge Spring 2018 | The Reveal!